So, you’ve started a blog! Now what? Well, I can tell you from first-hand experience that there are so many tools & resources available to bloggers. Some better than others. It’s easy to get sucked into buying everything you come across because you think you need it. Believe me, when I tell you that in my 6+ years blogging, I’ve wasted my fair share of money on tools I shouldn’t have. 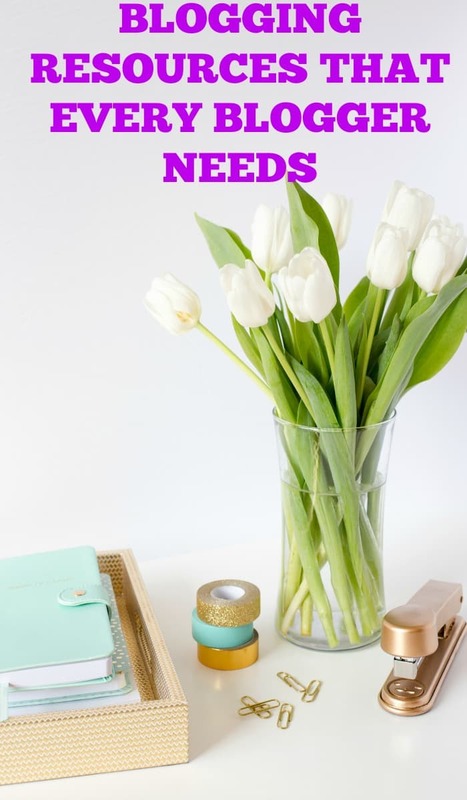 I really hope I can save you some of the headaches and bad financial decisions I caused by sharing my favorite tools and resources for bloggers. While most people will tell you to go with BlueHost, I’m going to be 100% honest with you. Run! Run! Run…far away from BlueHost! I’m in a ton of blogger groups and every single day I see bloggers with BlueHost complaining that their site is down. Yes, I get that BlueHost is affordable for a brand new blogger. However, I suggest investing a few more bucks and going with a host that will grow with you as your site grows. My #1 choice for hosting is Servously. I highly recommend Servously because the company is run by a small team that truly cares about their clients. If you ever have a post go viral, you won’t have to worry about your traffic getting throttled. You can check out Servously here. My 2nd choice for hosting is Site Ground. While I don’t have any personal experience with Site Ground, I have a ton of blogging friends who use Site Ground and swear by this company. I trust my blogging friends! You can check out Site Ground here. My 3rd choice for hosting is WPEngine. Again, I don’t have personal experience with this company but it comes highly recommended. I will say that it looks a tad expensive if you are brand new to blogging. You can check out WPEngine here. When it comes to social media you could buy so many tools to help automate things. I’m not a huge fan of too much automation as I want to connect with my readers and be on social media in real-time as much as possible. With that said there are a few tools that I use. Tailwind is a lifesaver when it comes to helping me keep my Pinterest schedule full. It helps me not only promote my own content but allows me to promote other bloggers as well. Tailwind also has Tribes which is an awesome feature for sharing your content with other bloggers. You can check out Tailwind here. Another Pinterest tool that I use is BoardBooster. This tool is not only affordable but helps me ensure that my content is always being circulated on Pinterest. Seriously, it’s been a game changer! You can check out BoardBooster here. When it comes to Facebook, I don’t use anything except the free scheduling tool within Facebook. Twitter isn’t a platform that I spend a lot of time on but you can use tools like HootSuite, TweetDeck or Buffer to keep your Twitter account full. You can check out TweetDeck and HootSuite here. If there is one piece of advice I’d give a new blogger it would be to work on your email list from day one! I waited almost three years to work on my email list and I majorly regret it. My #1 choice for email management is MailerLite. Not only is MailerLite free for the first 1000 subscribers but they offer so many amazing features! You can check out MailerLite here. My #2 choice is ConvertKit. ConvertKit is an extremely powerful email management tool that is very user-friendly. However, I find it very expensive for those of us that aren’t making much money with their email list. You can check out ConvertKit here. This is probably the biggest category for me as I feel like you should never stop learning. I probably spend the bulk of my blogging money on blogger education. I’m kind of an eBook and eCourse junkie! Thankfully for you, I’m only going to suggest the very best courses and books! Pinning Perfect is an amazing course for anyone getting started with Pinterest AND those experienced with Pinterest who want to increase their Pinterest traffic. You can check out Pinning Perfect here. With over 1,200 copies sold, Lena’s Traffic Transformation eBook is a must have for EVERY blogger! This book is amazing and worth every single penny. You can get your copy of the book here. If you are fairly new to blogging or feel stuck with blogging then Suzi’s book is perfect for you! This book has several price points making it affordable no matter what your budget is. You can get your copy of the book here. I currently take my own photos or purchase photos from DepositPhotos. You can check out DepositPhotos here. For photo editing, I use PicMonkey and Canva! Make sure you sign up for my newsletter for freebies & more blogging tips!